Ahead of commencement of the Closed Session of the 32nd Ordinary Summit of the African Union currently underway in Addis Ababa, President Hage Geingob in his capacity as the Chairperson of Southern African Development Community, held bilateral talks with the Secretary General of the United Nations. During the discussion with Secretary General Antonio Guterres, political developments in the SADC region, including in the Republic of Zimbabwe, the Kingdom of Lesotho and the Democratic Republic of Congo were high on the agenda. 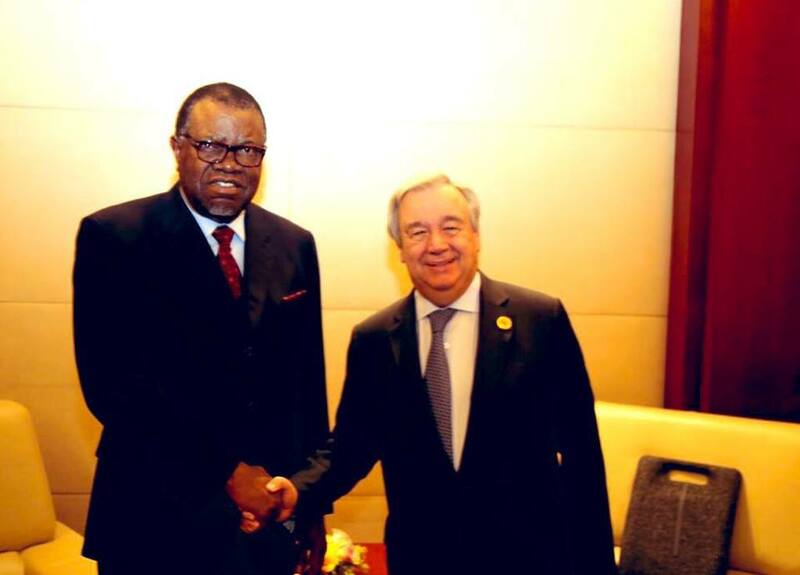 The importance of inclusive political processes was emphasised by President Geingob and he informed Secretary General Guterres that developments in the SADC region are positive while referring to the recent peacefully concluded elections in the Democratic Republic of the Congo and Madagascar. Dr. Geingob gave Secretary General Guterres the assurance that the elections were held in accordance with domestic processes and respect for national institutions. President Geingob said that SADC would continue to complement and support national processes in countries in the region in need of such assistance. The two leaders also agreed on the primacy of economic development and complementarities between SADC and the United Nations. At the conclusion of the bilateral talks Secretary General Guterres, thanked the Chair of SADC for the wise leadership demonstrated in steering the affairs of the region. The 32nd Ordinary Summit of the African Union was convened under the theme, “Refugees, Returnees and Internally Displaced Persons in Africa: Towards Durable Solutions to Forced Displacement in Africa”. President Geingob will hold several bilateral meetings on the margins of the 32nd Ordinary Assembly, including with the President of Estonia, Kersti Kaljulaid with the objective of deepening collaboration with the Government of Estonia on e-governance and digital transformation in Africa. Another meeting is with the outgoing Executive Director of the UNAIDS. The President will also participate in side-events where Namibia is an invited member. Upon arrival in Addis Ababa on Friday, President Geingob held bilateral talks with newly elected President of the Republic of Congo, President Felix Antoine Tshisekedi, to discuss political developments in the DRC, including how the SADC can assist the country in its efforts in favour of peace, stability and development. The two leaders agreed that President Tshisekedi would undertake a visit to the Republic of Namibia with the objective of deepening peace and stability in the DRC, and strengthening bilateral relations between the two countries. President Geingob also chaired the SADC Heads of State and Government Consultation with the objective of building common positions ahead of the 32nd Ordinary AU Summit. During the SADC Consultation meeting, President Tshisekedi, and the Zimbabwean President, Emmerson Mnangwagwa, briefed the Consultation meeting about political and socio-economic developments in their respective countries. 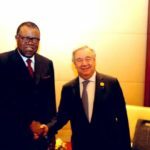 Recalling the decision of the 38th Ordinary SADC Summit held in Windhoek, President Geingob extended his sincere appreciation to the South African President, Cyril Ramaphosa, for having agreed to host the International Conference on Solidarity with the People of Western Sahara on 25-26 March 2019 in Pretoria. President Geingob concluded the SADC Heads of State and Government Consultation by stating that good governance and accountability as central to economic progress in the region.